James rejected an offer of one million dollars for his non-refillable bottle from James Pepper, a whisky distiller of Louisville, Kentucky because as a minister, he did not believe in contributing to the consumption of alcohol. In 1906, James invented the worlds largest egg incubator which at the time could hold over 2000 eggs. Apparently, no patent was applied for. He managed to strike natural gas in Petersburg and was awarded a contract to supply city of Petersburg a portion of his natural gas find for 25 years. The original purpose of the gas well was to supply gas to fire his glass factory in Petersburg where he intended to manufacture his famed glass coffin. In 1920 the Rev. 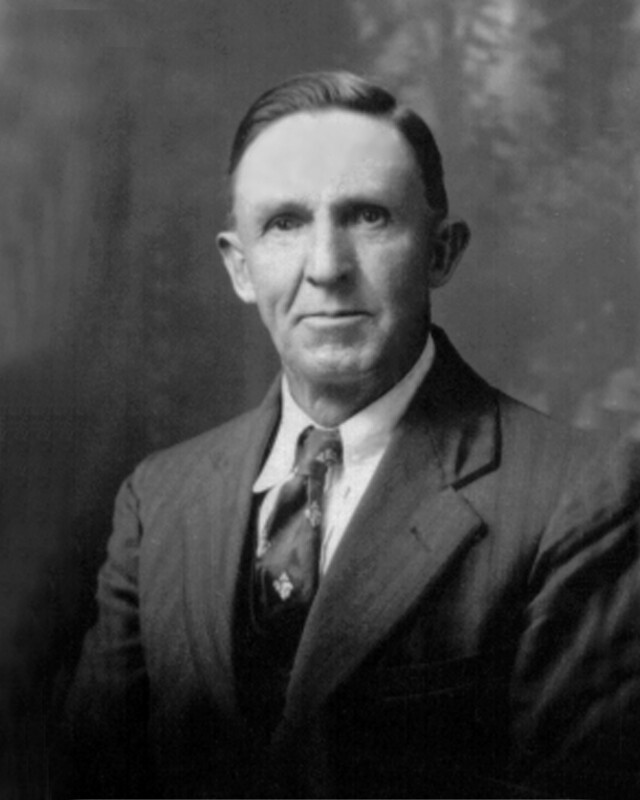 Stafford owned and operated a family coal mine south of Washington, Indiana supplying coal to that city. 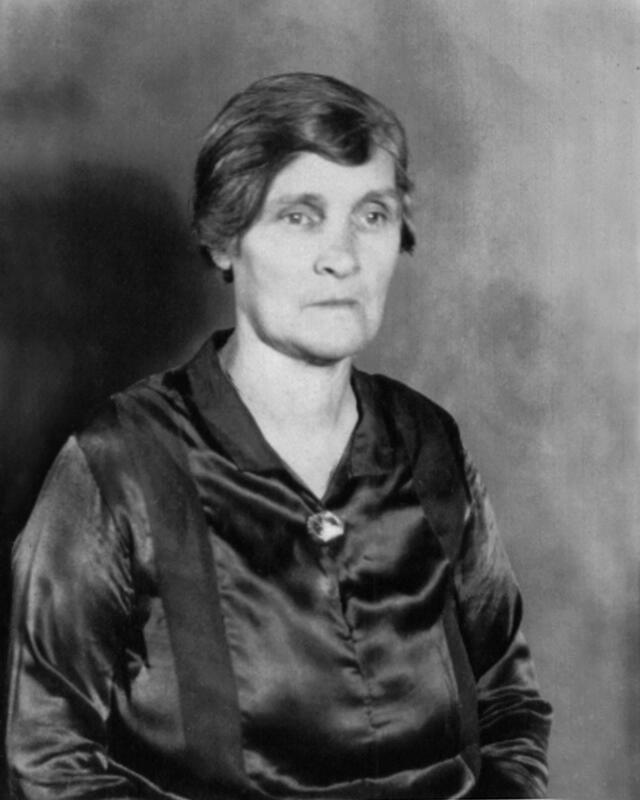 In 1934, the Rev. Stafford shocked the American political scene, announcing that he was considering running for President of the United States. At that time, he was the supreme commander of the Golden Rule Party and party members had rallied to support him, with claims of more than 20,000,000 votes. Newspaper headlines across America read, ” Republicans Ahoy! Man is Loose With 20,000,000 Votes”, “Glass Coffin Inventor Has Eyes On Presidency”, “Indiana Pastor Expects to be the Next President”. It is unclear if he indeed ran for this nation’s highest office, but the headlines can still be found in many newspapers from that year. One of the more interesting aspects of his life was that he loved the automobile. In 1903 he purchased a Zentmobile from the Single Center Buggy Company of Evansville, Indiana. He wrote a check for $750 and the first car in Pike County, Indiana was soon to create a storm. He wrote a story about his escapades with the vehicle and was later instrumental in helping Indiana develop the framework for the rules of the road for the Hoosier state. Rev. 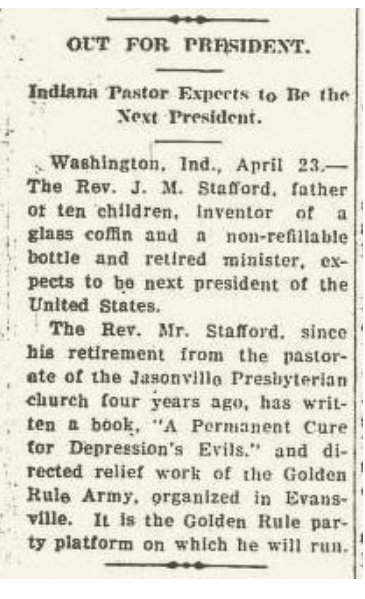 Stafford was heavily involved in the Temperance Movement in the early 1900’s. He worked hard to affect public opinion by organizing and then canvassing the many townships in Pike County, Indiana. He circulated a petition calling on lawmakers to hold a separate elections from all other issues in order to better control the manufacture and sale of intoxicants as merely a beverage. 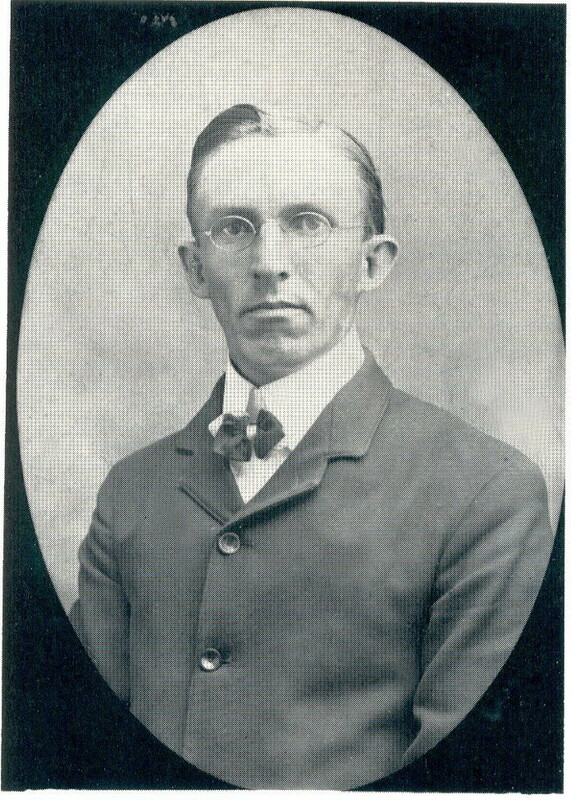 In April of 1911, Rev Stafford, who at that time was living near Blackburn, Indiana, completed a houseboat. He utilized his automobile to propel the house boat which also towed and additional raft with supplies for his family. He started down the White River with plans to connect to the Ohio River and then navigate to the Mississippi. His plans were to promote his latest invention the light focusing projector to towns along the way and ultimately to end up in New Orleans. 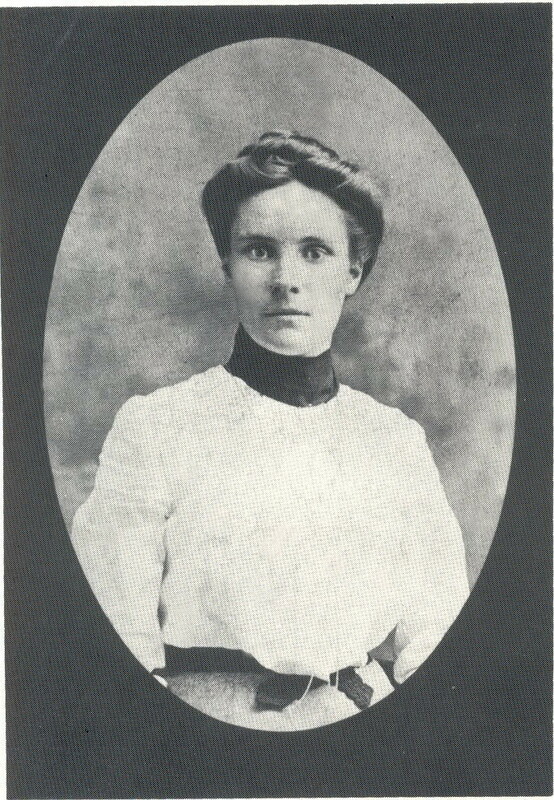 He only made it as far as Arkansas, where his daughter Eva Viola was born a year later in 1912. The Rev. Stafford had quite a following. He was known to not to pass out a collection plate, but rather to share a portion of his wealth with his followers instead. As a circuit riding minister, he routinely helped the needy among his followers, especially during the post depression era. He authored at least two books with deeply religions overtones, on how to solve many of America’s problems. In fact, he composed a paper which was dispatched to president Roosevelt requesting consideration of his ideas to be incorporated as a constitutional amendment, which was designed to help America prosper. Roosevelt’s secretary indicated that the proposal was under consideration. Undoubtedly, it ended up in the round file. James Morton Stafford was a forward thinking individual who developed his own ideas to link with the future, helping change the way American people would live their lives. He examined his existence and found ways to improve how he and others could better cope with the world at that time. His ideas may not have been absorbed into mainstream America, but the history of his contributions to Daviess County, to Indiana and to the United States, should not be forgotten. This entry was posted in Bartholomew County, Daviess County, Dubois County, Knox County, Pike County and tagged Horrell, Stafford on November 28, 2016 by oahblog.